Matt Dillon and Paul Quandt wear red and black high top Converse “Chuck Taylor” All Stars in the film. Carson, Shelley, Linderman, and Clifford take on the school bullies in My Bodyguard. 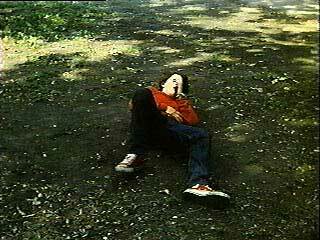 Clifford (Chris Makepeace) is the new kid at school. Immediately, he’s targeted by extortionist bully Moody (Matt Dillon), who demands Clifford pay him a dollar a day in protection money. Clifford refuses, and is terrorized for a while. Then, school legend Linderman (Adam Baldwin, in a perfect performance) returns. He’s a big, intimidating guy who reputedly killed a kid or shot a teacher or raped a teacher or any number of specious rumors. Even Moody and his goons are afraid of him, which gives Clifford an idea. He asks Linderman if he’ll be his bodyguard. It’s still paying for protection, but it’s not extortion, Clifford reasons. Linderman refuses. Clearly, he wants to be left alone. But when he sees Clifford being bullied, he decides to intervene. In a triumphant announcement in front of everyone, Clifford introduced Moody to his new bodyguard and lets him know the deal. Moody wants revenge on Linderman after he becomes Clifford’s bodyguard. Linderman makes it clear this is a one-time deal and tries to leave it at that, but Clifford is so grateful and, after learning the truth about Linderman’s past, pursues being his friend. And it works. For the entire second act, Clifford and Linderman spent time together. Linderman shows Clifford the motorcyle he’s working on. Clifford shows Linderman the hotel where he lives and his wacky family. Linderman even becomes sociable at school. All of these sinceres are sincere and pleasant. 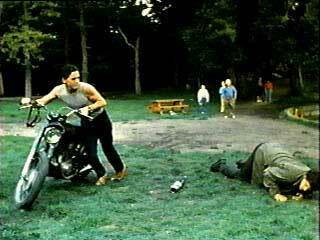 Then, Moody retaliates with his own bully, a bruiser named Mike (Hank Salas, who should’ve been in more movies) who beats the holy heck out of Linderman while Moody throws his beloved restored bike into the lake. Linderman retreats, but confides in Clifford the truth about his past. Its then Linderman realizes he has friends, a life, and can fight. 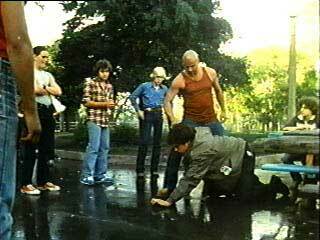 In a final scene, Linderman retrieves his bike as a pretense to bravely stand up to Mike, while Clifford, being extra-heroic, stands up against Moody in a fist fight. In the end, friendship and good prevails! The tables are turned when Moody comes up with a bodyguard of his own. My Bodyguard was a surprising drama in the early 80s for being a sincere light drama starring real young people. It would be a few years before John Hughes really brought teen anxieties and school society to the screen. The film remains surprising today, though, because so many movies about teens aren’t much more than pandering product, a sort of commercial for what adults decide is the new teen fashion. This film will click because it feels authentic and is just generally well-made. It has some detractions. There’s a whole series of scenes involving a rivalry between Clifford’s hotel manager father (Martin Mull) and some worm who wants to see him fired. Also, Clifford’s vibrant grandmother (Ruth Gordon, though they have to justify her alacrity by making her a lush) and her escapades. Ultimately, we want to see more of Clifford and Linderman’s friendship. The film is rewarding, but in a small way we’re left wanting. Moody starts to take away Linderman’s motorcycle after he is knocked down. Clifford and Moody go after each other in the park. Matt Dillon in his role as the bad guy Moody wears red high tops throughout much of the film, and Clifford’s friend Carson (Paul Quandt) is seen wearing black high top chucks in a few scenes. In the third act, Moody uses his red chucks to kick Linderman while he’s down. Later, they’re seen when Clifford heroically stands up to Moody. Its easy to fight when you’re already tough, but it’s harder when you’ve been a defenseless wimp your whole life. Moody falls down with a bloody nose and the shame of defeat. My Bodyguard. 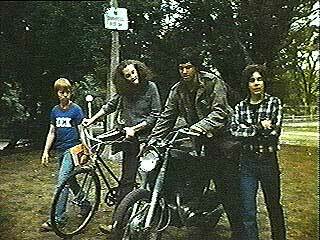 (1980) Chris Makepeace, Matt Dillon, Martin Mull, Ruth Gordon, Adam Baldwin, Paul Quandt. Directed by Tony Bill. Categories: Drama, Teenagers, Coming of Age.